The custom of adorning the church with trees, branches, flowers, and grass on Pentecost (Trinity Sunday) goes back to ancient times. The Old Testament Pentecost was the feast of the first harvest (Ex. 23:16). People brought the first fruits of their harvest and flowers into the court of the Temple. In New Testament times, the trees and other plants in the church symbolize the renewal of people through the power of the Holy Spirit which descended in the form of fiery tongues upon all of them. Additionally, it is the custom of the Orthodox Church for the faithful to bring bouquets of flowers which they hold in their hands, especially in the Divine Liturgy. In the Church’s annual liturgical cycle, Pentecost is “the last and great day.” It is the celebration by the Church of the coming of the Holy Spirit as the end – the achievement and fulfillment – of the entire history of salvation. For the same reason, however, it is also the celebration of the beginning: it is the “birthday” of the Church as the presence among us of the Holy Spirit, of the new life in Christ, of grace, knowledge, adoption to God and holiness. Then, having reached this climax, we are invited to kneel. This is our first kneeling since Easter. It signifies that after these fifty days of Paschal joy and fulness, of experiencing the Kingdom of God, the Church now is about to begin her pilgrimage through time and history. It is evening again, and the night approaches, during which temptations and failures await us, when, more than anything else, we need Divine help, that presence, and power of the Holy Spirit, who has already revealed to us the joyful End, who now will help us in our effort towards fulfillment and salvation. Thus is completed the feast of Pentecost and we enter “the ordinary time” of the year. Yet, every Sunday now will be called “after Pentecost” – and this means that it is from the power and light of these fifty days that we shall receive our own power, the Divine help in our daily struggle. At Pentecost we decorate our churches with flowers and green branches – for the Church “never grows old, but is always young.” It is an evergreen, everliving Tree of grace and life, of joy and comfort. For the Holy Spirit – “the Treasury of Blessings and Giver of Life – comes and abides in us, and cleanses us from all impurity,” and fills our life with meaning, love, faith and hope. In addition to the temple where we meet and worship on Saturday, Sunday, feast days and various other occasions, it is a part of normal Orthodox Christian life to have regular services in the home, usually in the “beautiful corner” set aside for such purposes. We all know about morning and evening prayers and house blessings, but there are other services that can be done in the home as “reader services”. Most of the services of the daily cycle can be done this way (except for the Divine Liturgy and other sacraments). In places without a priest, this has been a necessary means of keeping the life of the church going. “Every afternoon, I see you go into your shed for a while, and when you come out you look so peaceful. What do you do in there?” to which Alexey replied, “Come and see!”. Out of that little effort to do services in the home, and share it with others, a new Orthodox parish was born, and Alexey was eventually ordained a priest to serve there! 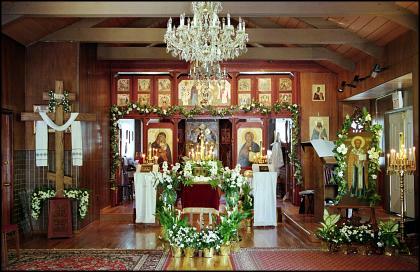 August is filled with important feast days such as Holy Transfiguration, Holy Dormition and St Herman of Alaska. There will be Vigil and Liturgy services for these feasts at St. Nicholas. We will not be able to do the daily Paraklesis service, which is traditionally done during the evenings of the Dormition fast. This is a good opportunity for you do this service at home as you can! In order to make this easier, You will find the full service on this page that you can download and place on your tablet or phone. It is in PDF format. Instructions in italics show you how to do this service as a “reader at home”. If you know the tones, or have sung this with us at St. Nicholas in the past, you can sing it at home. If you don’t know the melodies, you can simply chant it, singing only in your heart! Welcome to St. Nicholas Orthodox Church! Map and DirectionsSt. Nicholas Orthodox Church is part of the Orthodox Church in America, within the Diocese of the West, and belonging to the Pacific Central Deanery. We are located near the Saratoga Village, on the West end of Silicon Valley. Our members commute from all over the valley to celebrate in worship together and enjoy Orthodox Christian fellowship. We welcome all visitors, whether you are just passing through, or are new to the area, or are just curious about Orthodox Christianity. We will be more than happy to answer any questions that you may have. Come and experience the ancient faith and worship in a vibrant living community with us!